Nearly two years after I posted my first Killer Sudoku puzzle, I’d like to present you with it’s sibbling, my first ever Kakuro! For whatever the reason, I haven’t shown interest in these puzzles until recently. I thought I’d give them a go and here is the result. 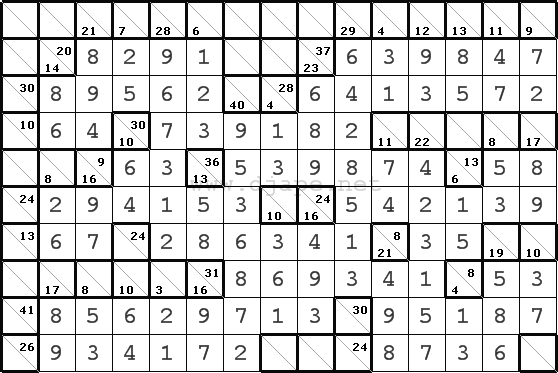 To be honest, knowing a thing or two about Killer Sudoku helped a lot in implementing them into my program. 🙂 Rules: Solve the puzzle so that the numbers in every horizontal and vertical region add up to the sum indicated for that region. Numbers CAN NOT be repeated in any region. UPDATE: I will start posting these puzzles on a weekly basis, every Thursday. They will be rather large Kakuro puzzles, at least 12×12 in size (and much bigger) and they will be posted here, on the main page of the site. I might even publish a Kakuro book! Kakuro 15×10 for Saturday, September 15, 2007. Clicking it will help in keeping this website free. 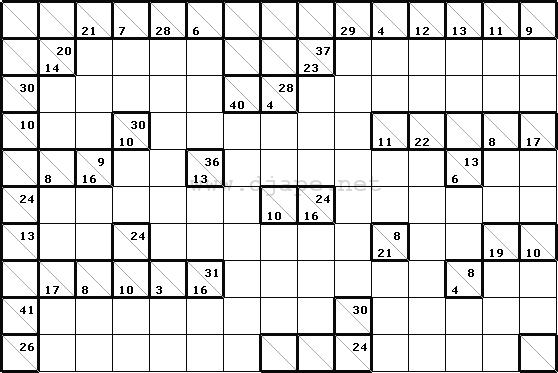 Find MORE KAKURO puzzles in the Kakuro category Enjoy! This entry was posted in Free sample puzzles, Kakuro and tagged BOOK, KAKURO, killer, killer sudoku, rules, Rules Solve, UPDATE. Bookmark the permalink. Post a comment or leave a trackback: Trackback URL. Glad to see you doing Kakuro! Looking forward to more of these DJ. One request – please make sure they fit easily onto one sheet of paper! I know it was Aristotle who made the famous quote the quip – It is well to be up before daybreak, for such habits contribute to health, wealth, and wisdom.